On the guitar, different C form chord voicings are played by breaking down the arpeggio pattern into smaller, fragmented pieces. Here are several ways to play partial chord shapes based on the full C form. In these examples, you fret and pick only the black dots. The numbers in the black dots are suggested fingerings. 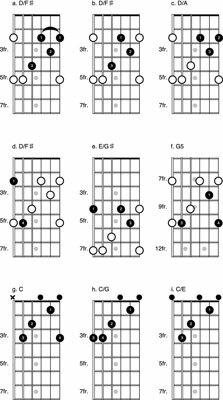 The white dots represent the remainder of the arpeggio pattern that you aren’t using. A is a fragment on strings 1 to 4. This chord shape is used in “Stairway to Heaven” by Led Zeppelin as a D/Fs. It’s considered a type of first inversion because the 3rd is in the bass position. You can play it either by barring with your 1st finger across the first three strings or by using all four fingers to fret each note individually. B is a fragment on strings 2 to 4 and is used in “Jack and Diane” by John Mellencamp. As shown in the figure, this chord voicing is D/Fs, but in “Jack and Diane,” it’s played together with the open A string as a D/A. It’s also moved two frets higher and used as an E/A. C is a fragment on strings 1 to 3 and is part of an open D chord. It’s also moved around the neck as different chords in “Hole Hearted” by Extreme. D is an inverted 3rd interval used in “Stay Together for the Kids” by Blink 182 as a D/Fs. Notice that the root of this chord shape is the note in the top position, D, not the note in the bottom position, Fs. Technically, this shape isn’t a full chord because it lacks the 5th interval, but roots and 3rds are usually written as major chords anyway. F uses notes spaced in a manner that requires you to mute the unwanted strings, fingerpick, or some hybrid of the two. It’s used in the song “Cliffs of Dover” by Eric Johnson as a G5. The “5” stands for power chord. Technically, this shape is only a root and 5th and not a full chord. G shows that you can play an open C chord with a high G on top. When you use fragmented chord shapes, make sure you still visualize the unused notes so that you can track what the chord name is. For example, in the D/Fs used in “Stairway to Heaven,” your eye should see the full C form barre chord and look to the 5th fret of the 5th string where your 4th finger would be to identify the chord voicing as a D.
Being so close to the open position D chord, you probably easily recognize the D/Fs as being related to it, but as you move further up the neck it becomes more difficult to identify fragmented chords and more helpful to visualize the root notes of the whole form on the 5th string. The style of Keith Richards from The Rolling Stones is built almost entirely around the use of a C form barre chord. Although he detunes his 1st and 5th strings and often omits the 6th string completely by not even putting it on, the rest of his strings, 2 through 4, remain the same as standard tuning.